The Mogao Caves, or Mogao Grottoes (Chinese: 莫高窟; pinyin: mò gāo kū) (also known as the Caves of the Thousand Buddhas and Dunhuang Caves), forms a system of 492 temples 25 kilometers (15.5 miles) southeast of the center of Dunhuang, an oasis strategically located at a religious and cultural crossroads on the Silk Road, in Gansu province, China. The caves contain some of the finest examples of Buddhist art spanning a period of 1,000 years. Construction of the Buddhist cave shrines began in 366 C.E., as places to store scriptures and art. The Mogao Caves have become the best known of the Chinese Buddhist grottoes and, along with Longmen Grottoes and Yungang Grottoes, one of the three famous ancient sculptural sites of China. The Mogao Caves became one of the UNESCO World Heritage Sites in 1987. As a depository of pivotal Buddhist, Taoist, and Christian documents, the Mogao Caves provided a rare opportunity for Buddhist monks and devotees to study those doctrines. In that regard, the caves served as a virtual melting pot of Christian, Buddhist, Taoist, and even Hindu ideas in China. The discovery of the caves that served as a depository of documents from those faiths, sealed from the eleventh century, testify to the interplay of religions. The Diamond Sutra and the Jesus Sutras stand out among the scriptural treasures found in the caves in the twentieth century. According to local legend, in 366 C.E., a Buddhist monk, Lè Zūn (樂尊), had a vision of a thousand Buddhas and inspired the excavation of the caves he envisioned. The number of temples eventually grew to more than a thousand. As Buddhist monks valued austerity in life, they sought retreat in remote caves to further their quest for enlightenment. From the fourth until the fourteenth century, Buddhist monks at Dunhuang collected scriptures from the west while many pilgrims passing through the area painted murals inside the caves. The cave paintings and architecture served as aids to meditation, as visual representations of the quest for enlightenment, as mnemonic devices, and as teaching tools to inform illiterate Chinese about Buddhist beliefs and stories. The most probable reason for such a huge accumulation of waste is that, when the printing of books became widespread in the tenth century, the handwritten manuscripts of the Tripitaka at the monastic libraries must have been replaced by books of a new type—the printed Tripitaka. Consequently, the discarded manuscripts found their way to the sacred waste-pile, where torn scrolls from old times as well as the bulk of manuscripts in Tibetan had been stored. All we can say for certain is that he came from the Wu family, because the compound of the three-storied cave temples, Nos. 16-18 and 365-6, is known to have been built and kept by the Wu family, of which the mid-ninth century Bishop of Tun-Huan, Hung-pien, was a member. 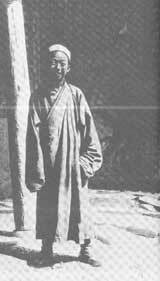 In the early 1900s, a Chinese Taoist named Wang Yuanlu appointed himself guardian of some of those temples. Wang discovered a walled up area behind one side of a corridor leading to a main cave. Behind the wall stood a small cave stuffed with an enormous hoard of manuscripts dating from 406 to 1002 C.E. Those included old Chinese hemp paper scrolls, old Tibetan scrolls, paintings on hemp, silk or paper, numerous damaged figurines of Buddhas, and other Buddhist paraphernalia. The subject matter in the scrolls covers diverse material. Along with the expected Buddhist canonical works numbered original commentaries, apocryphal works, workbooks, books of prayers, Confucian works, Taoist works, Nestorian Christian works, works from the Chinese government, administrative documents, anthologies, glossaries, dictionaries, and calligraphic exercises. The majority of which he sold to Aurel Stein for the paltry sum of 220 pounds, a deed which made him notorious to this day in the minds of many Chinese. Rumors of that discovery brought several European expeditions to the area by 1910. The travel of Zhang Qian to the West, Mogao caves, 618-712 C.E. Those included a joint British/Indian group led by Aurel Stein (who took hundreds of copies of the Diamond Sutra because he lacked the ability to read Chinese), a French expedition under Paul Pelliot, a Japanese expedition under Otani Kozui, and a Russian expedition under Sergei F. Oldenburg which found the least. Pelloit displayed interest in the more unusual and exotic of Wang's manuscripts such as those dealing with the administration and financing of the monastery and associated layman's groups. Those manuscripts survived only because they formed a type of palimpsest in which the Buddhist texts (the target of the preservation effort) had been written on the opposite side of the paper. The Chinese government ordered the remaining Chinese manuscripts sent to Peking (Beijing). The mass of Tibetan manuscripts remained at the sites. Wang embarked on an ambitious refurbishment of the temples, funded in part by solicited donations from neighboring towns and in part by donations from Stein and Pelliot. The image of the Chinese astronomy Dunhuang map is one of the many important artifact found on the scrolls. Today, the site continues the subject of an ongoing archaeological project. A close-up of the fresco describing Emperor Han Wudi (156–87 B.C.E.) worshiping two statues of the Buddha, c. 700 C.E. A complete view of the painting. ↑ 1.0 1.1 UNESCO, Mogao Caves. Retrieved July 21, 2008. ↑ China Page, Silk Road—DunHuang (Tun-Huang) Grottoes. Retrieved July 21, 2008. 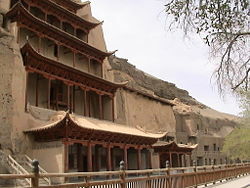 ↑ Travel China Guide, Dunhuang—Mogao Caves. Retrieved July 21, 2008. ↑ 4.0 4.1 International Dunhuang Project, Chinese Exploration and Excavations in Chinese Central Asia. Retrieved July 21, 2008. ↑ Leif Littrup, Analecta Hafniensia: 25 years of East Asian studies in Copenhagen (London: Curzon Press, 1998), 112. ↑ International Dunhuang Project, Homepage. Retrieved July 21, 2008. Akira, Fujieda, "The Tun-Huan Manuscripts." In Donald Leslie, Colin Mackerras, Gungwu Wang, and C. P. Fitzgerald. 1973. Essays on the Sources for Chinese History. Canberra: Australian National University Press. ISBN 9780708103982. Baumer, Christoph. 2006. The Church of the East: An Illustrated History of Assyrian Christianity. London: I.B. Tauris. ISBN 9781845111151. Hopkirk, Peter. 1980. Foreign Devils on the Silk Road: The Search for the Lost Cities and Treasures of Chinese Central Asia. London: Murray. ISBN 9780719537387. Littrup, Leif. 1988. Analecta Hafniensia: 25 Years of East Asian Studies in Copenhagen. London: Curzon Press. ISBN 9780700701995. Moule, A. C. 1930. Christians in China Before the Year 1550. London: S.P.C.K. OCLC 181797710. Mu, Soeng. 2000. Diamond Sutra: Transforming the Way We Perceive the World. Boston: Wisdom Publications. ISBN 9780861711604. Nhat Hanh, Thich. 1992. The Diamond that Cuts Through Illusion: Commentaries on the Prajñaparamita Diamond Sutra. Berkeley, Calif: Parallax Press. ISBN 9780938077510. Palmer, Martin, and Eva Wong. 2001. The Jesus Sutras: Rediscovering the Lost Scrolls of Taoist Christianity. New York: Ballantine. ISBN 9780345434241. Riegert, Ray, and Thomas Moore. 2003. The Lost Sutras of Jesus: Unlocking the Ancient Wisdom of the Xian Christian Monks. Berkeley, Calif: Seastone. ISBN 9781569753606. Saeki, P. Yoshio. 1951. Nestorian Documents and Relics in China. Tokyo: Maruzen. OCLC 52011545. Tang, Li. 2004. A Study of the History of Nestorian Christianity in China and its Literature in Chinese. Frankfurt am Main: Peter Lang. ISBN 9783631522745. Core Teachings of Diamond Sutra with visual art by Fernando Casas. This page was last modified on 12 October 2018, at 15:46.